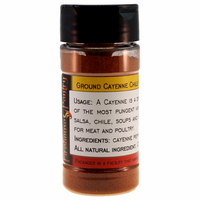 Product Details: A Cayenne is a dried capsicum pepper and is one of the most pungent varieties of chile. Makes a good all-purpose chili pepper for adding heat to any dish. We like it in salsa, chili, soups, stews, dips, and mixed into rubs for meat, poultry and seafood. Ingredients: cayenne pepper. All natural ingredient. Packaged in a facility that also handles wheat, milk, soy, egg, sesame, peanuts, and tree nuts. Nutrition Facts: Click here for data per 1 gram serving. Click here for data per 100 grams. 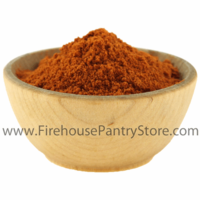 We use this to make our: Mike's Mesquite BBQ Rub; Firehouse Shake All-Purpose Seasoning; Cheddar Beer Dip & Spread Mix; Tomato Horseradish Dip Mix; Roasted Onion, Garlic, and Pepper Dip Mix; and Hot Diggity Clam Dip Mix.